The Coastal Highway is meant to connect one end of Chile’s long, narrow territory to the other, running north to south as close to the Pacific Ocean as possible. PUERTO SAAVEDRA, Chile, Dec 27 2012 (IPS) - For more than two decades, Mapuche indigenous people in the Chilean region of Araucanía have been fighting the construction of the Ruta Costera (Coastal Highway), a megaproject initially conceived during the Augusto Pinochet dictatorship (1973-1990) which has already caused significant archeological and cultural losses and damages. The Coastal Highway is meant to connect one end of Chile’s long, narrow territory to the other, running north to south as close to the Pacific Ocean as possible. The completed highway would be more than 3,340 km long, of which more than 2,600 km have already been built. This highway project has become one of the main challenges facing numerous successive governments in Chile, who have consistently come up against the opposition of native communities. In the Araucanía region, 674 km south of Santiago, the Coastal Highway would encompass 41.6 km of the Puerto Saavedra-Toltén section, precisely where the Budi Indigenous Development Area is located. The authorities maintain that the initiative will help to integrate isolated areas, decrease travel times and promote the development of new tourism destinations. The ancestral inhabitants of the area are the Lafkenche, a branch of the Mapuche indigenous people whose name means “people of the sea”. Leonardo Calfuneo is a Lafkenche “lonko” (chief) in the community of Konin Budi, made up of some 60 families. “We are opposed to this megaproject because, for the Mapuche people, it will not bring progress or development, but rather the irreparable destruction of our culture,” he told Tierramérica*. Calfuneo lives with his wife on a small parcel of land in a cozy wood house, where they offer the bitter herbal tea known as “mate” and “sopaipillas” (deep-fried flatbread) to their guests. “We make a living from small-scale farming, we are peasants, we are a people with a centuries-old culture and we have always lived off of the land,” he said. Calfuneo has personally confronted the advances made by the highway project, which is not being undertaken by a construction company, but rather by the Military Work Corps, a branch of the Chilean armed forces. In March, the military corps and their machinery carried out work on his land without authorization, destroying hedges made up of medicinal plants as well as one of the community’s sacred religious sites. “They are coming through here and destroying everything in their path to widen the road. We are not only losing our lands, but also medicinal plants and drainage areas,” he reported. In his community, “each family has three, five or 10 hectares to live on,” a small area of land considering that only a few decades ago this entire area was made up by Mapuche communal lands. Through Decree Law 2568, passed in 1979, the Pinochet dictatorship divided up these communal lands into individual properties. Many of these were acquired by private parties, largely companies in the tree plantation, energy and fish farming sectors. Local authorities claim that the Coastal Highway will enhance interconnection along the coast and thus promote the economic development of the region. “This is a project that has taken a long time to complete, and we would like to be able to overcome the obstacles it has faced,” Andrés Molina, the governor of Araucanía, told Tierramérica. “We support this project for various reasons. But, in practice, we have not been able to conduct an assessment of the social and economic profitability of these roads,” he admitted. Although the quality of roads in the area has improved, “now we are working towards a social profitability study in order to be able to move forward with paving. We won’t be able to do anything until we have internally conducted a social assessment that will make it possible for us to invest as a country,” he said. These deadlines frighten Luis Aillapán, who is the “gempin” of the community of Konin Budi – the guardian of knowledge on the culture, religion and philosophy of the Mapuche people. For him, the construction of the highway represents “great suffering”. “We are used to our natural surroundings, to walking a short distance to the sea and fishing for the resources we need,” he told Tierramérica. Aillapán grows crops and raises a few animals. He and his family feed themselves with what the land and sea provide for them. From his house he looks out to the Pacific Ocean on one side, green fields on the other, and a few hills that form part of the coastal mountain range. But on the edge of his lands, the military workers and their machinery are clearing the way for the highway. “Some of our own people have turned against us, and during the night we hear gunshots that are meant to intimidate us,” he charged. His wife, Catalina Marileo, and their four-year-old son were charged in 2002 with assaulting civil servants from the Ministry of Public Works who were carrying out feasibility studies for the project. Later, Aillapán, his wife, his sister-in-law Margarita Marileo and Marileo’s husband were charged and tried under the country’s anti-terrorism law, which was passed during the dictatorship and is now used almost exclusively to penalize Mapuche resistance. The municipality of Saavedra, covering some 401 sq km between the Pacific Ocean and Lake Budi, a saltwater lake, had a population of 13,481 in 2009. More than 80 percent of its inhabitants live in rural areas, and 73.2 percent identify themselves as Mapuche. There are 3,295 people living in the Budi Indigenous Development Area, who make up 24.4 percent of the municipality’s total population. And on Huapi Island, located in Lake Budi, there are 43 communities inhabited by some 5,000 Mapuches. A study by the Universidad de la Frontera commissioned by the government in 2001 reported that 45.2 percent of the population was in favor of the Coastal Highway while 52.9 percent opposed it. The situation changed when the former mayor of Puerto Saavedra, Ricardo Tripainao, traveled around the communities to explain the benefits of the highway, such as the higher prices they could charge for their products and the millions that the government would pay them for expropriating their lands. Tierramérica observed that today, many people are angered over the government’s failure to comply with these payments and by the increase in the width of the land to be expropriated, which was initially 13 meters, but in many parts has reached 20 or even 25 meters. 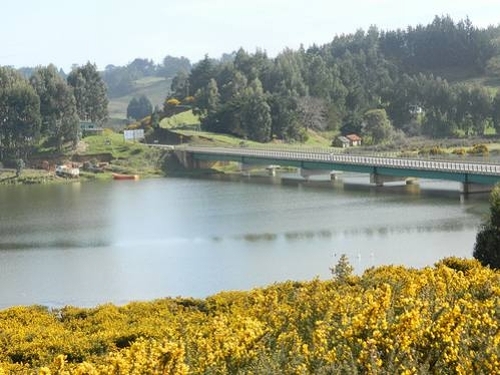 But among the inhabitants of the municipal capital of Puerto Saavedra, an urban area with numerous tourist attractions, feelings towards the highway are favorable, since it will attract more visitors and reduce the town’s isolation. The Military Work Corps camp in charge of the highway construction is moving to one of the shores of Lake Budi, a cultural heritage protected area. Convention 169, which was adopted in 1989 and entered into force in Chile in 2009, establishes guarantees for indigenous communities, and in particular the right to be consulted on activities or projects in their territories.